MB Model RHT-32" diameter brush (8ft)Three Point Hitch Hydraulic Drive Windrow Type Single (or dual) motor - 32 inch diameter brush Mounts to tractor rear three point hitch, Category I or II. Driven from tractor hydraulic system. Single motor arrangement requires 12-16 gpm @ 2000 psi; dual motors require 25-30 gpm @ 2000 psi. Optional independent hydraulic system may be available in certain applications where tractor loader hydraulics are not of sufficient capacity. 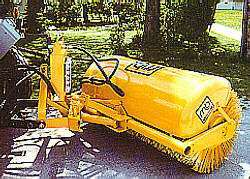 Brush is driven by single hydraulic motor coupled directly to the core by a splined shaft. See options for dual motors. Customer provides hoses and couplers to connect tractor hydraulics to bulkhead at rear of broom. Price does not include hydraulic valve(s). Brush on/off with tractor valve. 32 inch diameter sectional brush, with choice of polypropylene, wire or combination radial segments. Manual angle change 30 deg. right and left is standard. Optional hydraulic angle change is available. Broom lift is provided by three point hitch. Estimated shipping weight: 850 lbs (6 ft), 900 lbs (7 ft), 950 lbs (8 ft).